It’s rare for undergraduate science students to be involved in lengthy, robust research projects under the guidance of experienced faculty. It’s even rarer for an undergraduate to research the contents of soil from Antarctica. 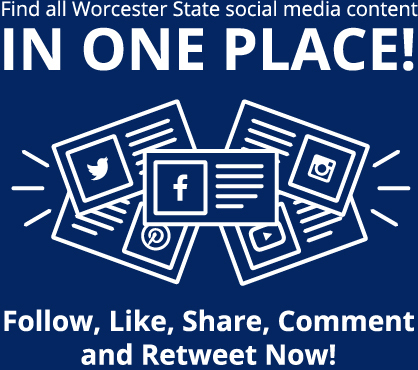 Except at Worcester State. Thanks to the Dr. Imoigele Aisiku, M.D. ’92 Interdisciplinary Research Grant program, Worcester State science students can apply to spend a summer doing research. William Rodriguez, a senior majoring in biotechnology, was one of last year’s students to be selected for a fellowship. Last spring, Assistant Professor of Biology Roger Greenwell, Ph.D., presented Rodriguez with the prospect of applying for the fellowship to research soil samples from Antarctica, which Associate Professor of Earth, Environment, and Physics Douglas Kowalewski, Ph.D., brought back from one of his fieldwork expeditions in the Dry Valleys of Antarctica. The soil of Antarctica holds many mysteries that scientists have been revealing and debating since Ernest Shackleton and his crew returned from a 20-month journey across the frigid continent in 1916. These soils even have their own “soil order” called Gelisols in the United States (Cryosols in Canada and Europe, and Cryozems in Russia) because they are vastly different from other soils from around the world. “There aren’t many times that one is offered an opportunity such as this,” Rodriguez says. He was first introduced to “the wonders of soil” in his first year of college at Mary Washington University in Virginia. As part of the Phage Hunter program, he helped examine soils from various areas to isolate bacterial viruses and identify their characteristics. Any viruses were tested to see if they would “infect deadlier relatives of the bacteria being studied,” he says. At Worcester State, where Rodriguez has been since his sophomore year, he focused on the bacterial and fungi that might be contained in the Antarctic soil samples. He will be presenting his findings at this year’s Celebration of Scholarship and Creativity on Wednesday, April 18. There are several noteworthy characteristics of the samples at Worcester State that raise their cool factor. 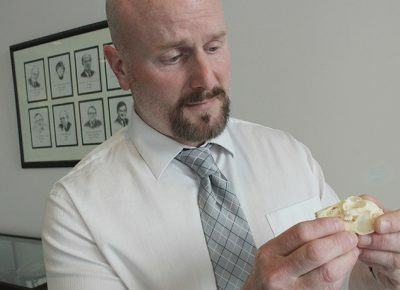 First, “it’s a core sample taken from a region in Antarctica that has been untouched by man” from between 13 to 17 million years ago and the moment Kowalewski pulled the soil out of the ground in the mid-2000s. That virgin quality extended to any bacteria in the soil. Second, Rodriguez has found 17 different isolates of bacteria. Finding even one isolate in the samples “was really a shot in the dark,” he says. It’s not unusual for soil researchers to be unable to culture organisms from similar samples in similar environments. Third, he conducted a metagenomics analysis to examine the soil’s total DNA contents. He wanted to see the “total spectrum of bacteria” living in these particular soil samples. The second part of this analysis involved putting a layer of the Antarctic soil over “known lab strains of bacteria” and then shining ultraviolet light on them for two weeks. The result was Rodriguez’s most surprising discovery. “The value and intrinsic properties of DNA” are among the core tenets of biotechnology, Rodriguez explains. WSU’s biotechnology program teaches students a variety of techniques in molecular biology, microbiology, and chemistry to prepare students for expansive projects. Spending eight hours a day, five days a week in the lab allowed Rodriguez the time to fine-tune these skills and boost his overall “lab etiquette” and mental math ability. He will be one of two students presenting his research on the Antarctic soil samples at the annual Celebration of Scholarship and Creativity on Wednesday, April 18 from 3 to 5 p.m. in the Wellness Center. During his final year at Worcester State, Rodriguez, the recipient of WSU Foundation’s Tarun and Amita Mukherjee Memorial Scholarship and Robin L. Kaplan TJX Companies Memorial Scholarship, applied to several doctoral programs in microbiology. He was recently accepted into University of Massachusetts Amherst’s program and is excited about working toward his Ph.D. in Microbiology. “I love what I do and spending time the lab,” he says. 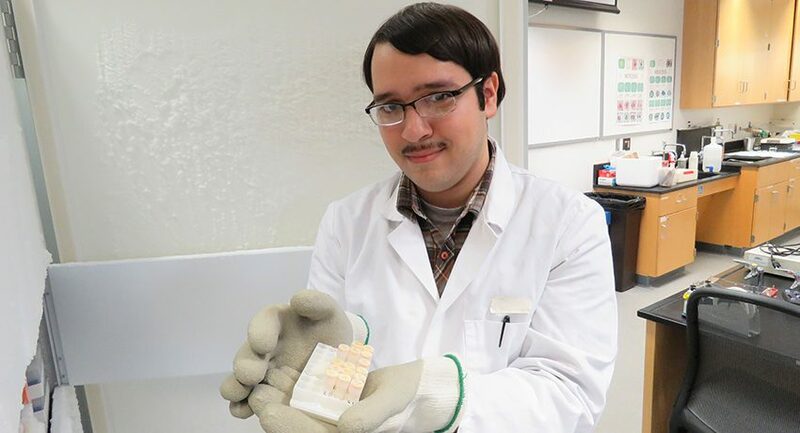 About the Photo: William Rodriguez holds frozen samples of Antarctica he analyzed for his research project. Professor of Biology Randall Tracy, Ph.D., wants to bring a new molecular technique to Worcester State University that will make it easier to track the elusive New England cottontail rabbit so that remaining populations of the dwindling species can be located. Tracy, a noted expert on the New England cottontail and other small animal species, plans to learn the technique during his sabbatical . . .